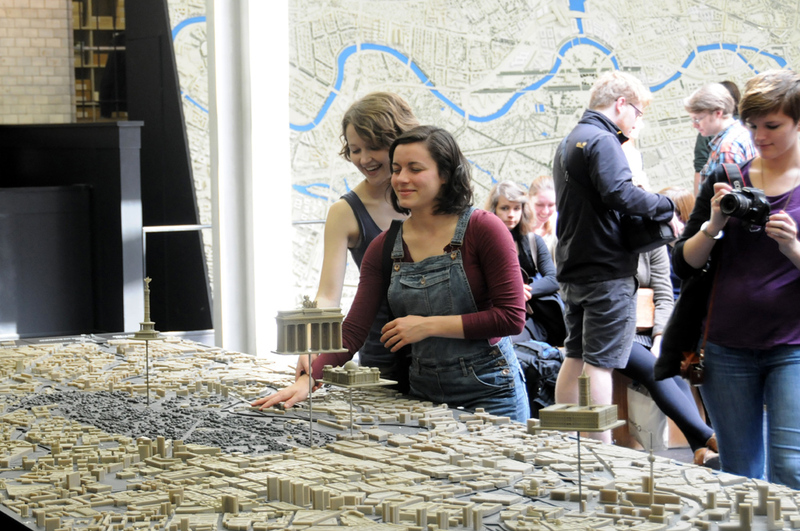 1:2000 Scale "Talking Tactile Model of Berlin"
With the tactile model of Berlin urban spaces and buildings of the inner city can be detected by touch. With the Tactile Model on a scale of 1:2000, the inner city of Berlin can be experienced in a new way by those who have difficulty seeing or are blind. Commissioned by the Senate Department for Urban Development and the Environment, the "Faculty of Modelling and Design of the Institute for Architecture" of the TU Berlin Technical University developed this exemplary tactile model together with a team of people with disabilities. In addition to the sensory experience of touching the contours of the city model, over 150 points of interest can also be explored acoustically or in typeface with the help of state-of-the-art technology. In order to make Berlin and its public spaces accessible to everyone, not only in city models but also in real life, the two brochures "Berlin – Design for all – Öffentlich zugängliche Gebäude und Öffentlicher Freiraum" (Berlin - Design for all - Publicly accessible buildings and public space) elaborate the fundamental design aspects of a barrier-free city. Pictures of the city model "Sprechendes Tastmodell - Berlin"
At the entrance to the building Köllnischer Park 3 , there is a doorbell with a Braille inscription to the right of the door. You can contact the doorman by ringing the bell. When you enter the building, the doorman’s office is up two steps to your right. The doorman will accompany you to the exhibition space. You can also walk about 10 m straight ahead from the building entrance until you reach a railing. Turn left here and go down a staircase to reach the exhibition space. From here, tactile floor markings will lead you to the models and the information counter. At the information counter, you can request an audio set which will provide you with acoustic information about 150 points of interest depicted in the Inner City Model. Four audio sets are available.